I think it would be safe to conclude that one of the main reasons the original Masters of the Universe franchise was so successful is the diversity of characters introduced into the line. And the “formula” for creating all these interestingly unique characters was pretty simple, either give said character an exaggerated physical feature, like an oversized fist or a retractable neck….or make some sort of human animal hybrid. The end result of the 2nd formula gave us a mix of really visually interesting beast-men, snake-man, bird-men and of course insect-men. Giant insects or humanoid insects are probably one of the most common hybrids in popular science fiction. 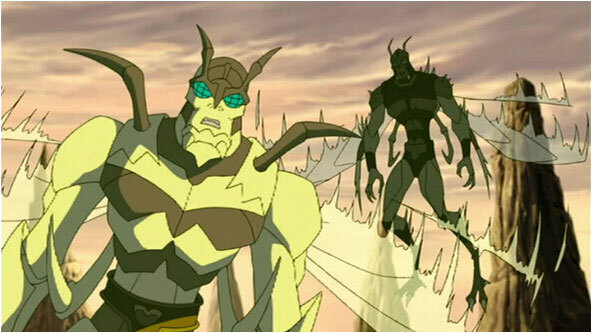 From the Japanese grasshopper themed superhero Kamen Rider, the giant killer bug swarms in Starship Troopers, Bug & Mantis from the Guardians of the Galaxy, and of course Blind Melon’s “Bee Girl”(kidding), insect themed characters are everywhere. 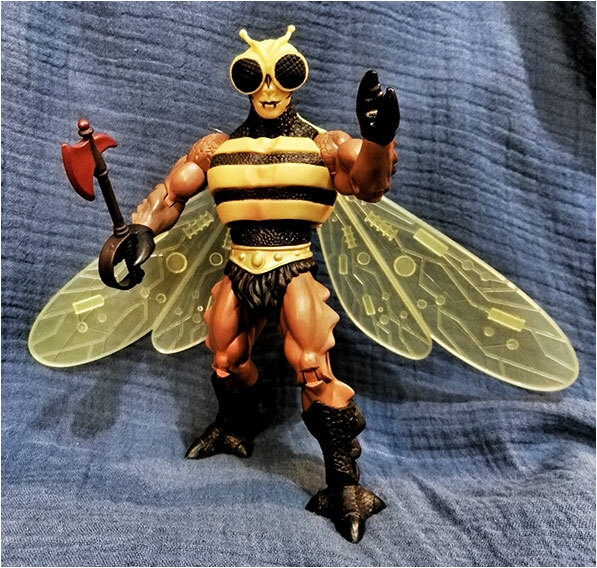 In the toy department, the company Coleco even tried their luck with their own Masters of the Universe inspired line called Sectaurs: Warriors of Symbion which you guessed it, featured a world populated by human/insect warriors. 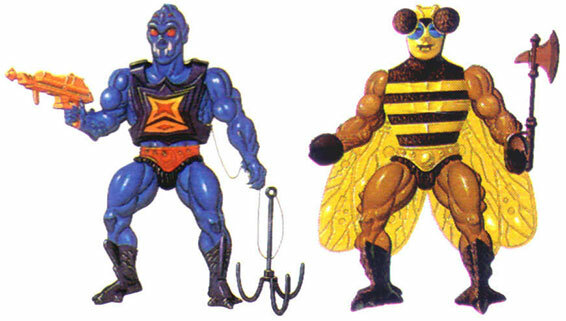 Of course, Mattel made sure insects were properly represented in their Masters of the Universe line on both sides. 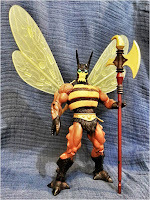 Skeletor’s evil warriors got their “spider/man” Webstor (ok I know, spiders aren’t insects but arachnids...but close enough) and the heroic side got the bee themed hero Buzz-Off. Buzz-Off the heroic Heroic Spy in the Sky was introduced as part of the 3rd wave of Masters of the Universe in 1984. If his name didn’t already give it away, there was no mistaking who he was supposed to be. 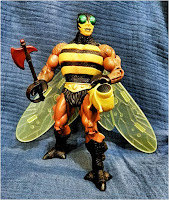 Despite a rather goofy looking head design with a “helmet” that looked like Mickey Mouse ears, there was no mistaking he was a “bee guy” with his big blue-ish green bug eyes, predominant yellow stripes across his chest and of course his huge insectoid wings. What’s interesting to note though was that this originally what he was supposed to be(e). 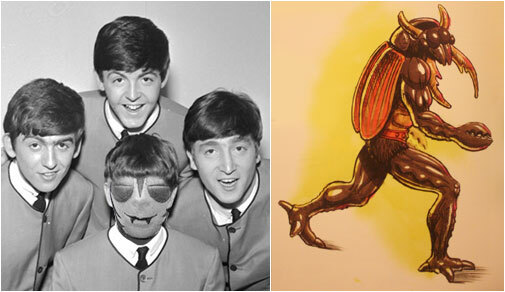 Based off really early concept notes and art, Buzz-Off was originally supposed to be a half man, half beetle called Bugoff. He was also referred in some notes as Mandible Man...for obvious reasons. Further character refinements changed his character to a half man half wasp...or more accurately a full man dressed up in a wasp costume! Eventually though they combined the two ideas and brought back the more interesting hybrid concept and we got the Buzz-Off that we know today. 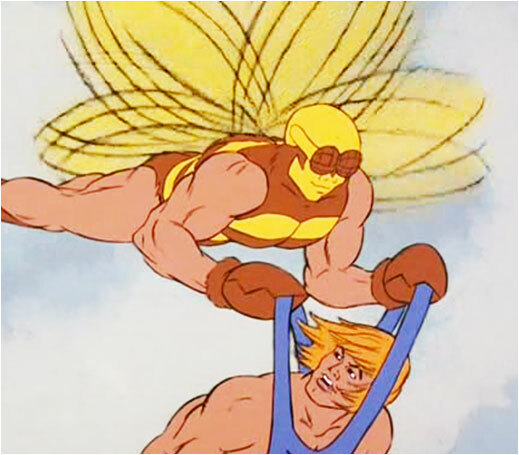 Initially, aside from his physical appearance and abilities, there wasn’t much personality wise that differentiated Buzz-Off from the other heroic masters, he was just another one of He-Man’s loyal allies. 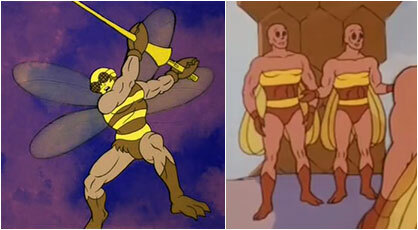 One unique detail introduced though in the original Filmation cartoon was that he was actually a member of an entire race of bee people which would be further fleshed out in the rebooted series in 2002. 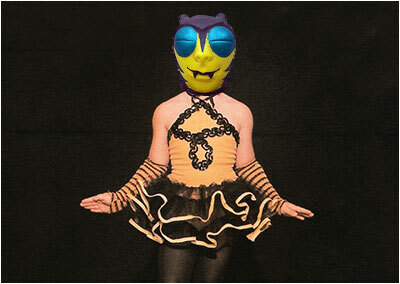 In the 2002 Mike Young Production, Buzz-Off was the recipient of a massive physical and character overhaul. 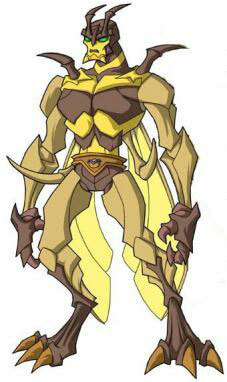 Whereas almost all the toys in the original toyline shared the same muscular hunched over body shape with a few tweaks here and there, the 2002 reboot sought to reimagine the designs of most of the characters to give them more unique physical appearances. As a result, Buzz-Off received a slimmer, bony and more angular insectoid looking body with added appendages for good measure. He was also fortunate to receive a more distinct personality. 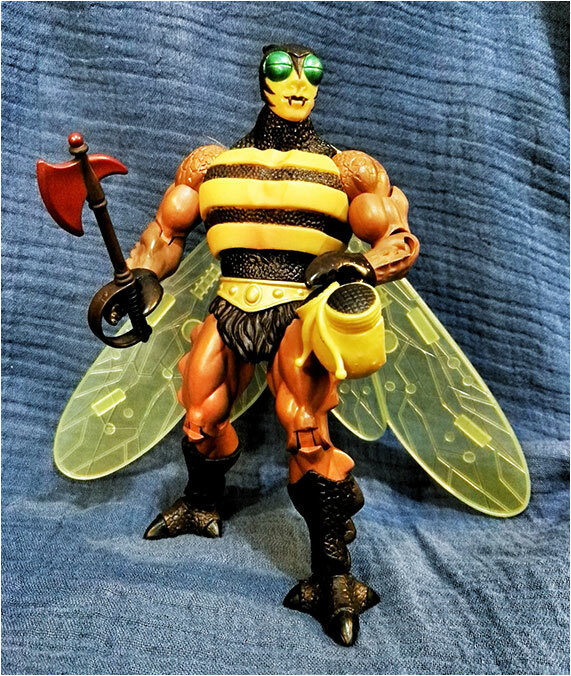 In the new cartoon, he was now the leader of the bee people now called the Adreenids who produced a powerful substance called ambrosia. Because ambrosia was highly sought after by many Eternians, the Adreenids were a rather isolated and distrusting race. And Buzz-Off was the most distrusting of them all. 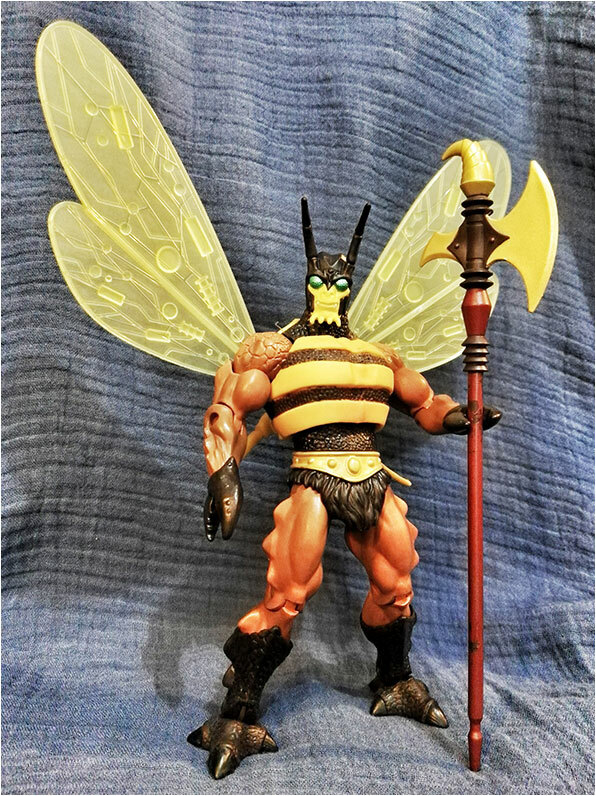 In fact initially, Buzz-Off refused to join He-Man in his crew in his battle against Skeletor. Eventually it took a grand manipulation by Skeletor that almost set off a war between the Adreenids and the Bird People led by He-Man’s ally Stratos, over his precious ambrosia that ultimately convinced Buzz-Off to join the heroic warriors. And even as a member of He-Man’s heroic warriors, it took awhile for Buzz-Off to really “gel” with his team. His suspicious and prideful nature often isolated him from everyone else (giving his name “buzz off” a more significant meaning) and led him to tackle on greater enemies on his own without seeking the aid of his allies. 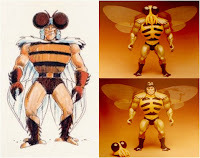 On the toy front, as one of the more popular characters in the franchise, Buzz-Off was fortunate to get proper plastic representation in all the three main Masters of the Universe toylines. Unfortunately, I never owned the original vintage version myself...I “shared” him with my friend. I did however get the heavily redesigned 2002 version which while never depicted in the show even came with it’s own “Mickey Mouse” cap as a nod to the vintage toy. And finally I got the Classics version which was the one I was most excited for. When the Classics line first started in 2008, it was touted to be composed of all the ultimate versions of the different He-Man characters, incorporating details from all different iterations of the franchise. And initially it was, with the first few figures while mostly based off the original vintage designs coming packaged with extra accessories and swappable parts (most notably extra heads) that homaged the more modern 2002 look. 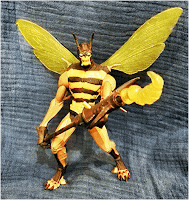 Unfortunately that trend didn’t last very long as the later releases including Buzz-Off lacked any extra parts. The Classics Buzz-Off was pretty much a straight up update of the original figure complete with a less goofy (but still goofy) head design and the Mickey Mouse helmet. To be fair, in a nod to the 2002 design, they did include some tiny extra insect appendages on his back but that was it….a sorely needed modern redesigned extra head was nowhere to be found. 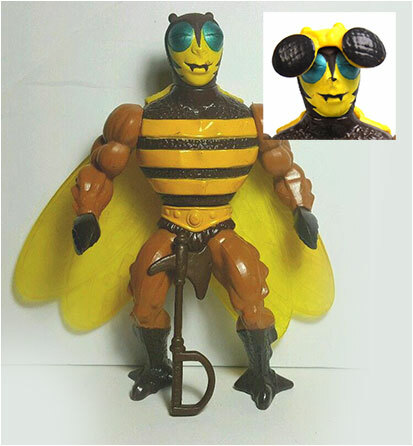 Fortunately, years later, Mattel made up for this by releasing a 2002 inspired “head pack” which included one for Buzz-Off. While the end result is...not as perfect as I was hoping (ok I’ll admit, there is a certain charm to that original goofy head), it is nice to now have the option to display him either way. 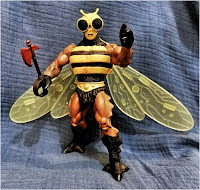 I may not be the biggest fan of insects in general, but even I’ll concede that, visually they can be very interesting which is probably why Buzz Off to this day remains one of the more remembered and recognized members of the Masters of the Universe.